In an attempt to avoid feeling anxious and overwhelmed on a regular basis (as I have been lately), I decided to put together a little 'Feelings Bottle' last night. It's just a soda bottle with the label peeled off. 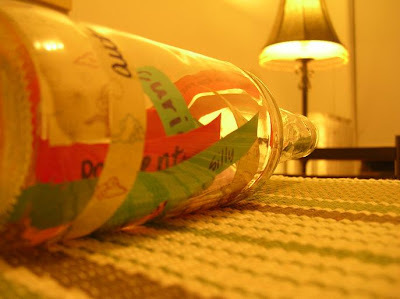 I cut up all lots of different feelings words, rolled them up, and stuck them all inside the bottle. Yes, this is probably a project many of you did around the age of 7, but it seemed like a helpful idea. :) People always say, "Be positive" which is great advice. But, lately I've been wondering if there are some other attitudes to adopt within the 'positive' family of feelings. It's always good to have emotional variety, right? I'm hoping maybe just looking at the bottle will remind me (and whoever else wnats to be reminded) that so much of the time, we get to choose how we feel. What a gift. 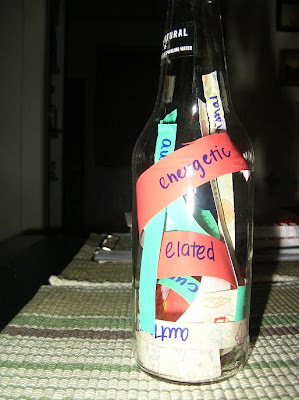 So, some of the options in the bottle include: elated, silly, energetic, authentic, forgiving, patient, and curious. I hope you have a great day, and if it isn't too great, I hope you are able to find something beautiful about it anyway. You're amazing; don't forget it.